Shirts With Random Triangles: Georgia Adds 4-Star OT Prospect Netori Johnson To Its 2017 Recruiting Class. 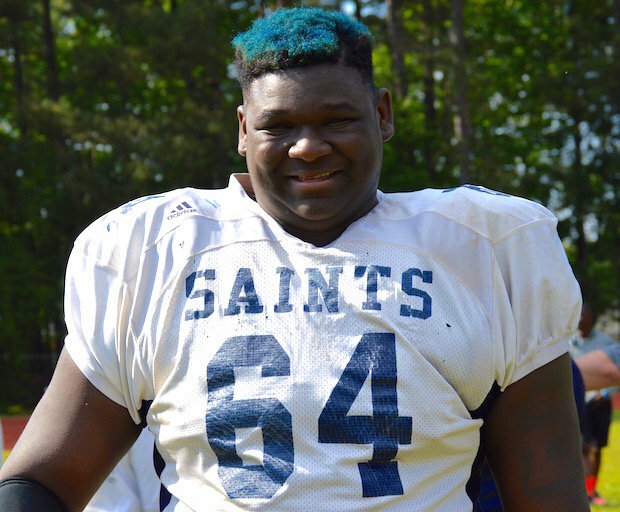 Georgia Adds 4-Star OT Prospect Netori Johnson To Its 2017 Recruiting Class. Netori Johnson. Image via al.com. Georgia has added an eighth member to its 2017 recruiting class. Ellenwood, Georgia high school junior offensive tackle Netori Johnson committed to the Bulldogs on Tuesday. Johnson was previously committed to Alabama from June of 2015 until January of 2016. 247Sports grades Johnson as a composite four-star offensive tackle prospect. The recruiting website ranks Johnson at no. 4 among OT prospects for 2017, at no. 14 among 2017 prospects from the state of Georgia, and at no. 122 among 2017 prospects nationally. Johnson attends Cedar Grove High School in Ellenwood, Ga. He stands 6'3.5, and weighs 348 lbs.